They are the rocks that have formed by changes from other rocks such as sedimentaries, igneous rocks, or other metamorphics. As opposed to igneous processes, metamorphism is a solid-state process, which means the rocks are exposed to mechanical stress, or rising pressures and temperatures, but not so high that the rock would melt and turn into magma. Neither do they form from eroded or organic material like sedimentaries - they form directly from other rocks. In metamorphic processes the mineral crystal size increases, porocity decreases, and new minerals appear and old ones disappear. 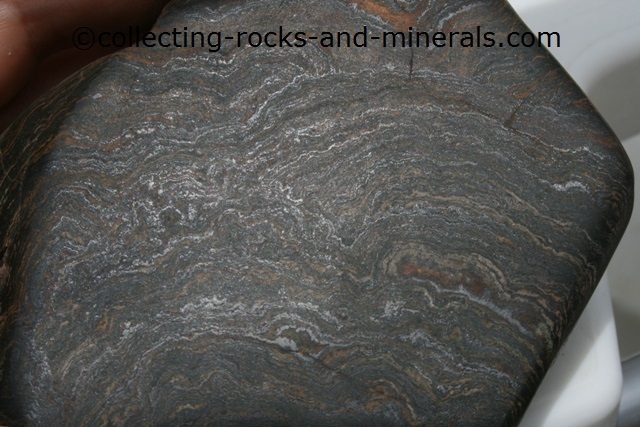 The rocks that experience different kinds of mechanical stress, can be compressed, elongated and/or twisted, which creates the impressive foliation they are famous for. Others are "schisty" - with clearly visible layers or plates which have a perfect cleavage. This is not to be confused with the layers of sedimentary rock, which have no cleavage or the wavy foliation of metamorphics. While you can be pretty sure a foliated or "schisty" rock is a metamorphic, not all metamorphics have foliation or shistiness. There are three main types of metamorphic rock. Dynamic metamorphics have impressive foliations.